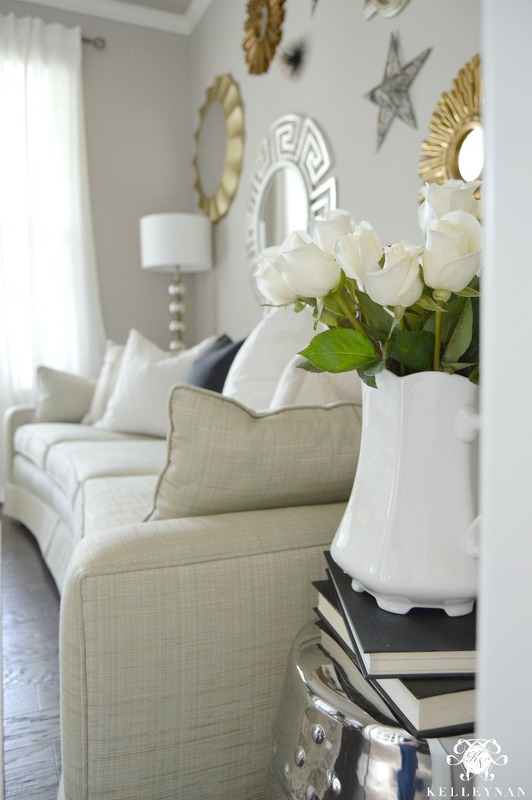 Our formal living room sits to the right as you first walk through the front door. As the room you see upon first entering, you would think that I would have developed a little more of a plan before starting on this space, but nope. I was so overwhelmed by all the other rooms when we moved in, that I didn’t have the energy to devote brain power to this room initially. I was thankful for two things. 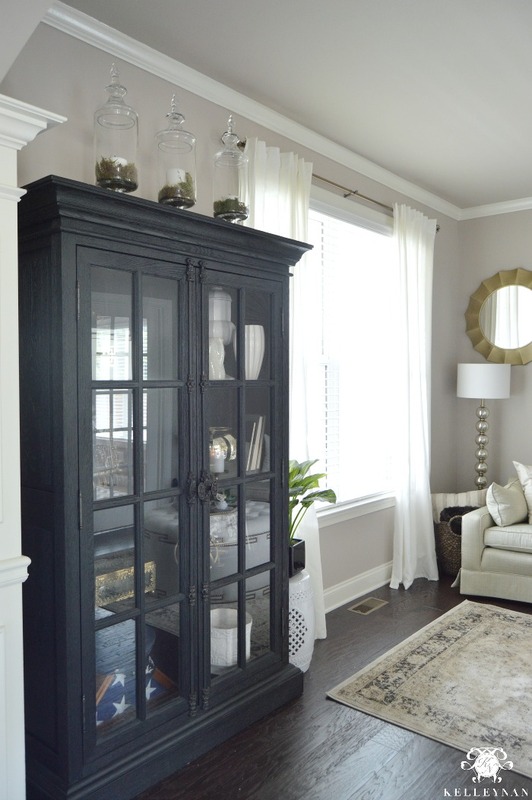 1. that my antique sofas which had been passed down over generations hadn’t sold during my previous Craig’slist attempt, and 2. that I found a handsome, black french casement cabinet from the Restoration Hardware Outlet in perfect condition. The sofas needed some work – I had them reupholstered, re-sprung, and some cushions replaced. 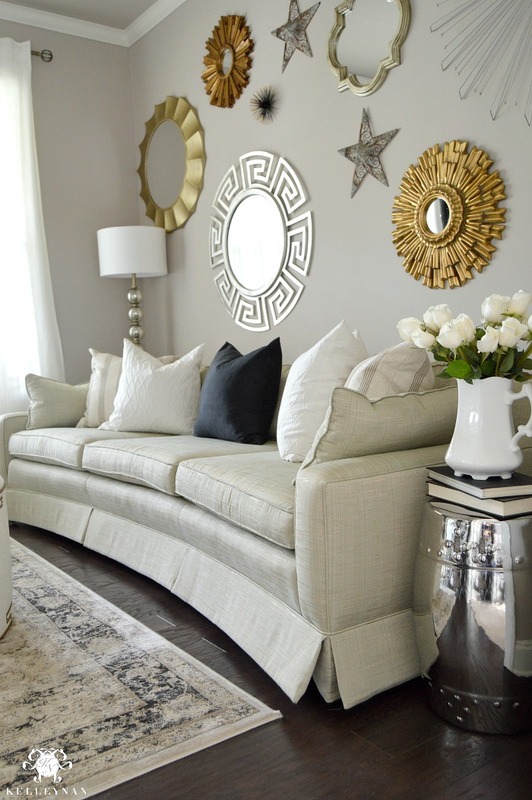 I positioned the love seat and the curved sofa in an ‘L’ formation and slapped a mirror on the wall whose frame looked like the spots of a watercolor cheetah. Nope, that wasn’t going to work. 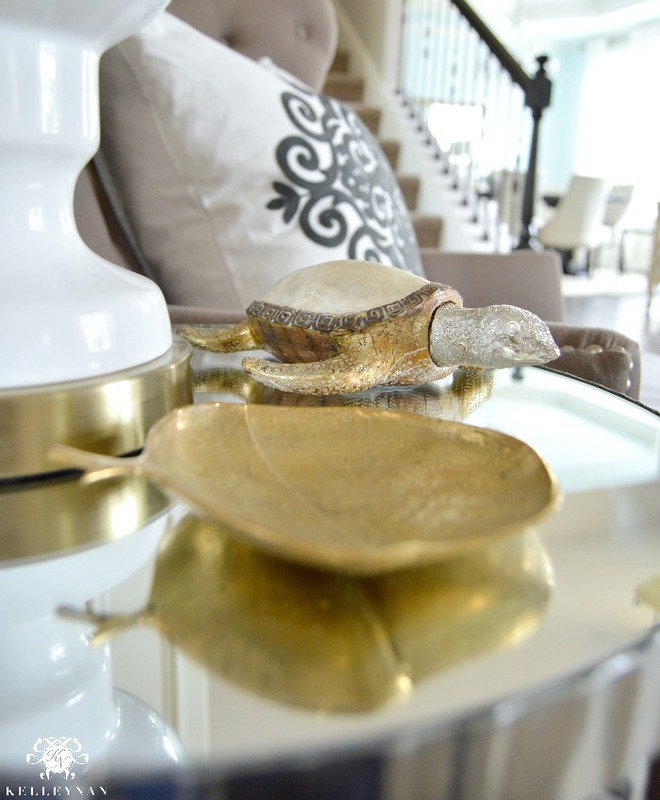 I was just starting to get into sunburst mirrors so I came up with a concept of doing a gallery with mixed metals – a little more glam, a lot less conventional. The rest of the room was filled with cast-offs and honestly, it was fine but I didn’t love it and I certainly wasn’t super proud of the first impression when people entered our home. After switching the furniture around and taking some pieces out, I knew what I really wanted was a unique statement piece – something that was “fun” and would go with the gallery wall but had a bit of a traditional look, too. I immediately thought of the fuchsia ottoman I had ordered a few years ago from My Chic Nest for my “closet room”. I love this piece and still have it, but without a full room for a closet, it stays a bit hidden. (You can check out my closet tour HERE). 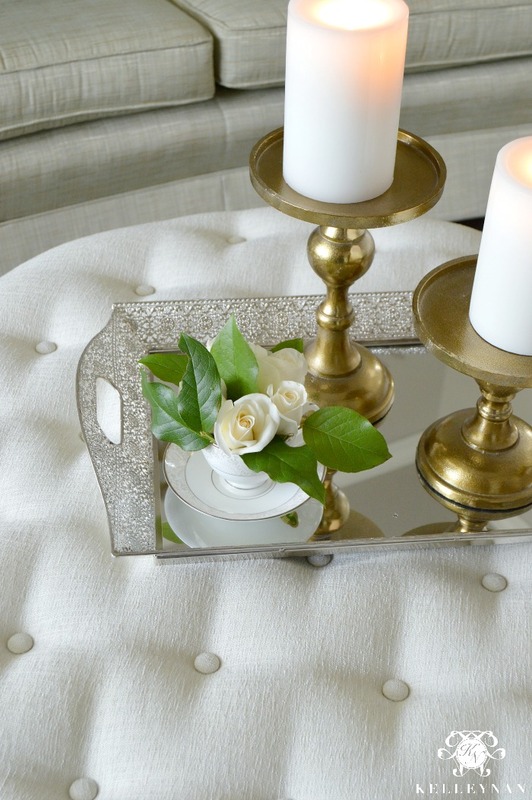 I knew the same Elle ottoman I adored in a neutral color would be just the thing. 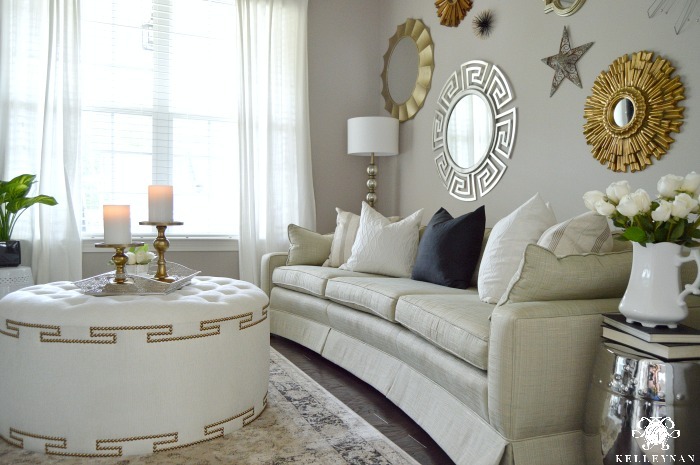 Last week it arrived in all its tufted, Greek key nailhead trim goodness; I loved it immediately but almost had a “crisis” when I decided it needed to be in both this living space, and the sitting area of my bedroom. I found this parasol art at Pier One many years ago. I had it in the dining room and recently moved it in here to mix with the gold tones. 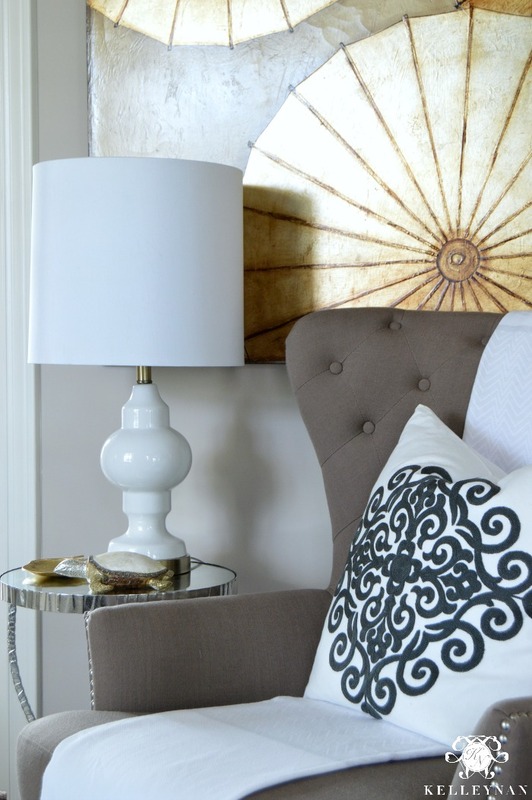 This Catalina pillow from Pom Pom at Home is also a recent addition. Along with the ottoman, I have wanted to, and have, moved this little beauty all over the house. My mom and I take occasional quick trips to Biloxi to meet up and “have our fun” 😉 This little turtle came from a shop inside the Beau Rivage. I love that he is made of mixed metals (which is pretty much what this entire room is all about). They don’t make couches like they used to; this thing is unbelievably heavy and has moved with me seven times. Before her latest makeover, she was white. Ok, after seven moves and hanging out in basements and storage rooms, sorta white. 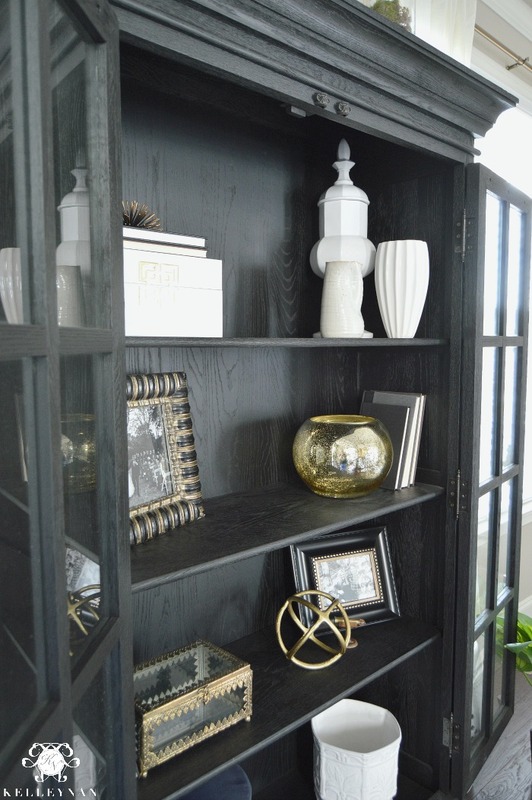 This black cabinet holds a few special items – we still have to get some photos of Dave’s grandfather, a captain and pilot in World War II, framed along with a display for some of his medals. While this piece used to be on the opposite wall, I felt like it closed everything off a bit. We now only have the sofa in this room (the love seat relocated to the sitting area of our bedroom). 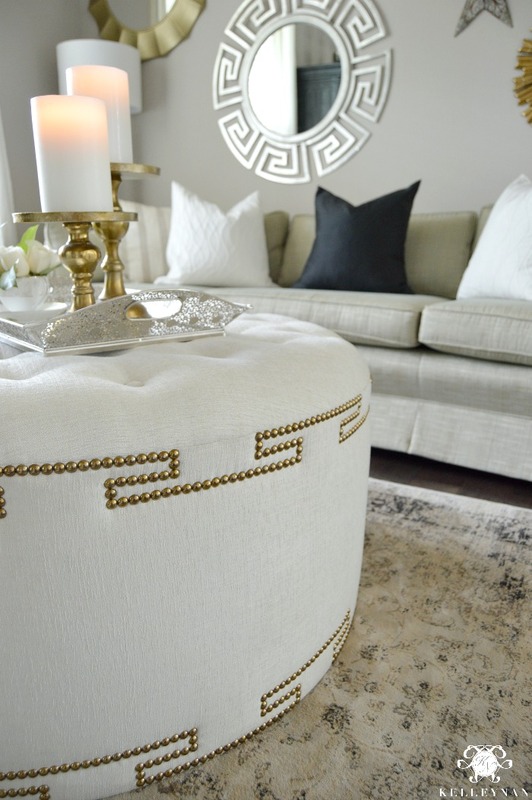 Check out that beauty- the ottomans are custom built and you get to choose your fabric and nailhead trim. 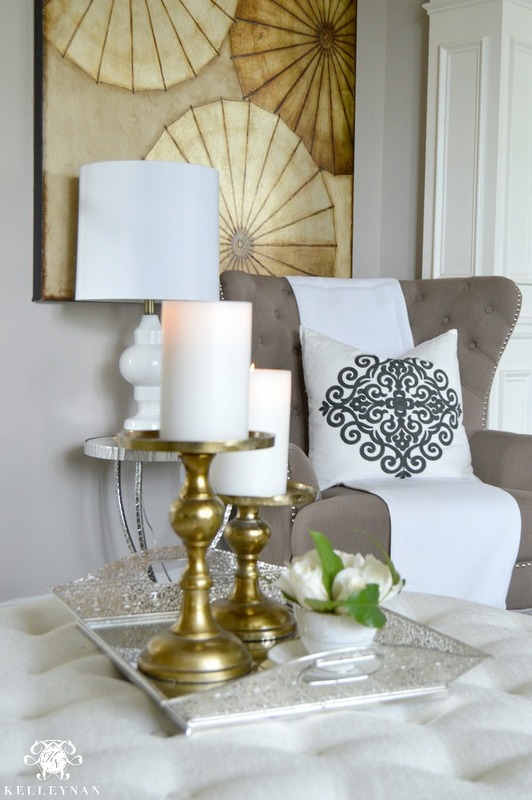 To get some fabric samples, click HERE. 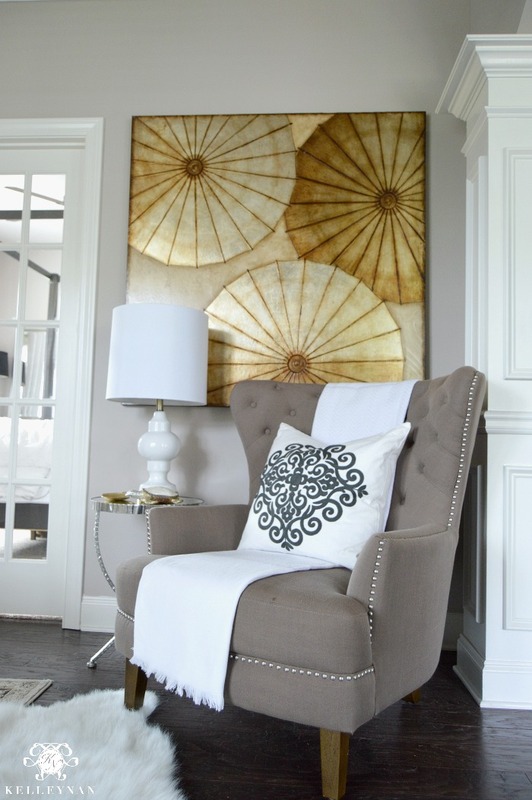 I love this space; the gallery wall does make it a little trendier than most of my rooms but by keeping a neutral base, as I typically do, the classic styles in here lend themselves well to lots of other possibilities. Note: This is a sponsored post by My Chic Nest. While I received product and/or compensation for my review, all opinions are my own. Another beautiful room! 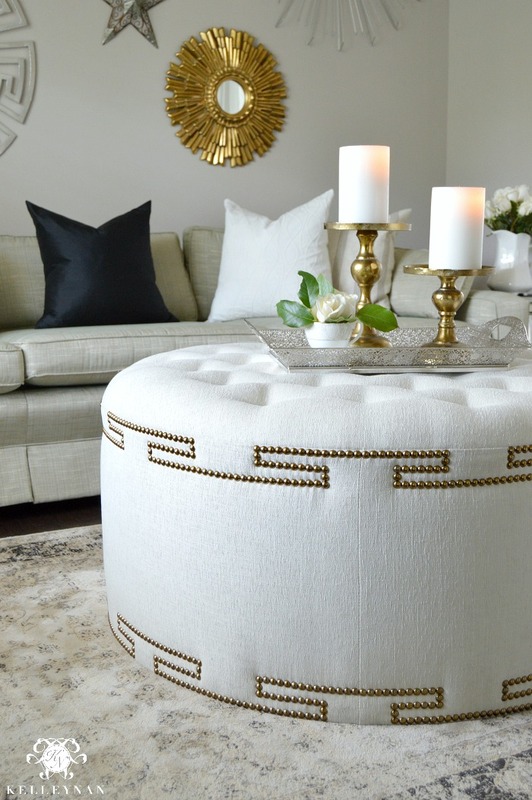 That ottoman is boss – it’s the perfect thing for your space!! 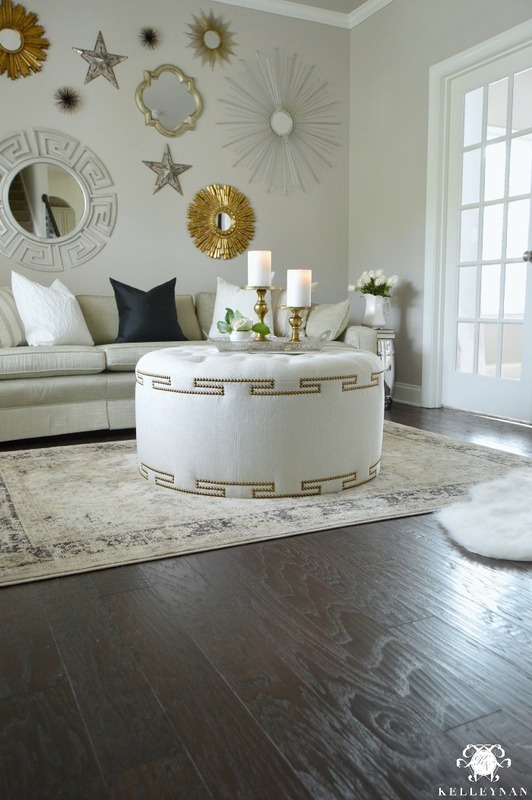 Your living room is really coming together nicely, but the ottoman is to die for! I also love that black cabinet and how you put those mementos in there. 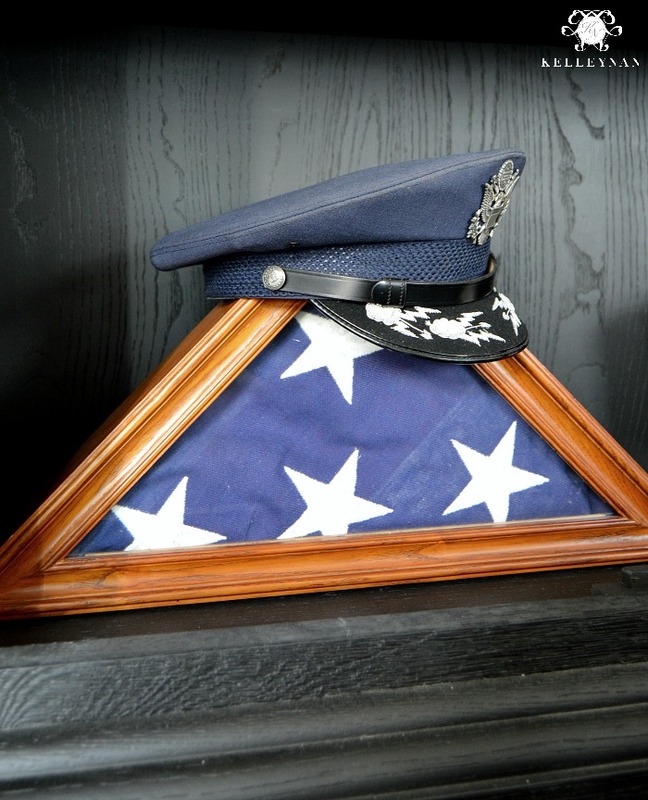 I have a lot of similar items from my father who spent twenty years in the Army and who died when I was only thirteen. I have his flag, his Commendation Medal and some other medals along with some award letters and photos that I’ve been wanting to display. 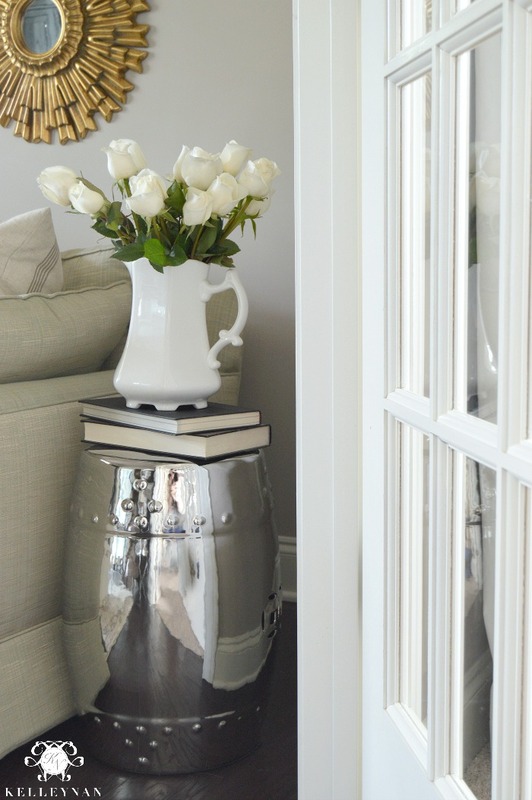 I love the way you used all of those types of things in your glass front cabinet. Nice living room, I’ve fallen in love with your ottoman ! 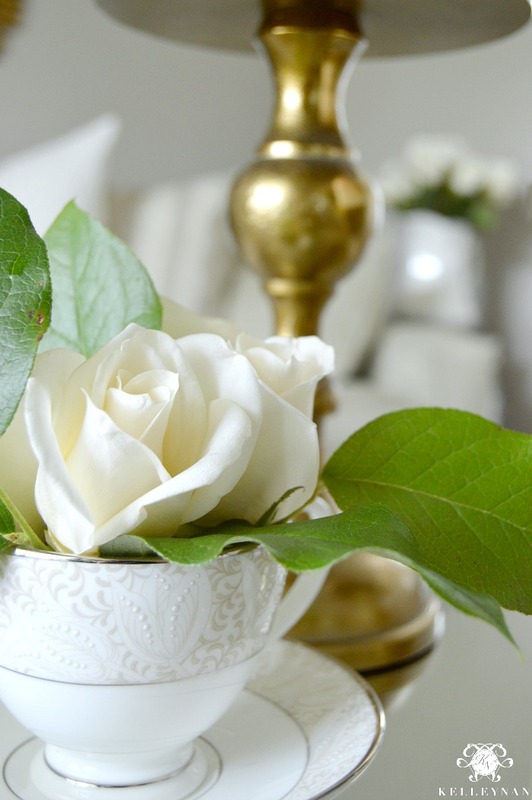 But with my children..here would be very little left of his white…, in any event, thank you for your article. KELLY!! It amazes me how truly talented you are! Thank you for your response last week. 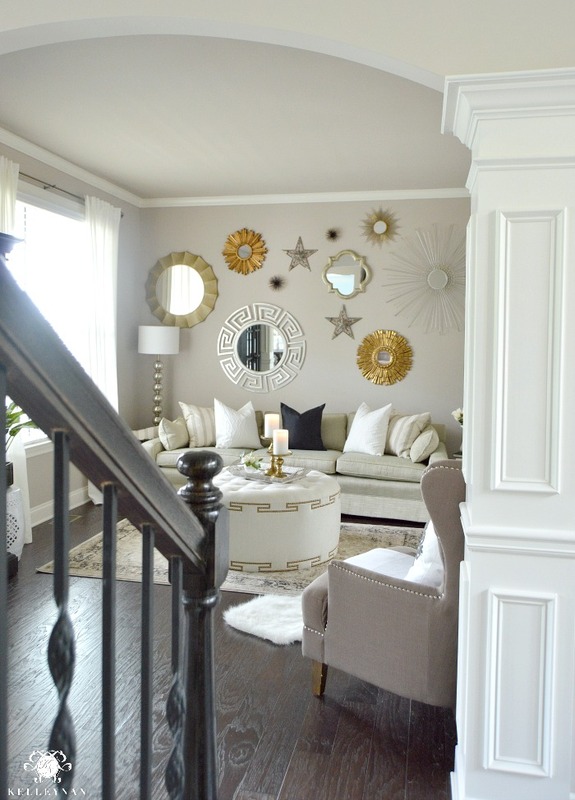 Do you usually paint your ceilings the same as the wall color or is it white? -And just out of curiosity, when do you choose to use matte over semi-gloss? I have both in my home but currently changing things up and wanted your opinion. TYSSSM! !